The economic and environmental benefits of a sustainable building are clear: Healthier and safer for occupants, lowered operating costs, increased asset value, tax rebates and zoning allowances and other financial incentives. 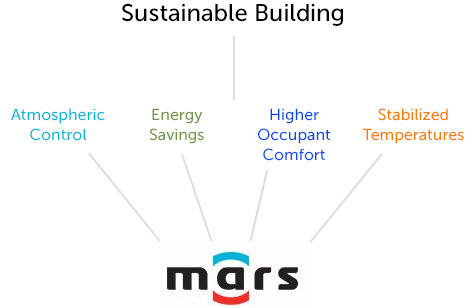 Learn more about how Mars has been part of sustainable solutions from the very beginning. The Mars air curtain forms a strong protective barrier over every building opening and repels incoming dust, debris and flying pests while protecting costly climatized air. With a direct correlation to reduce your utility spend without placing obstructions that lead to unsafe vehicle and personnel traffic, Mars is a critical component to atmospheric control and efficient HVAC operations. Operating your facility without Mars at every opening, forces your HVAC systems to work harder and run longer to maintain set temperatures. Your utility spend rises and your equipment requires more frequent maintenance and replacement. No sustainability solution is complete without Mars to work tirelessly without creating any obstruction of impediment to easy flow of equipment and pedestrian traffic.